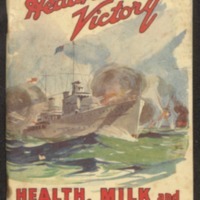 Produced in the first half of the 20th century for the Executive of the ‘Twenty-First Annual Sydney Health and Milk Week Campaign’. Health week was founded in 1921 by Professor Harvey Sutton and Dr J S Purdy ‘ to focus public attention for one week in the year on matters of health’, in particular how it is about personal responsibility. Contains tips on how to get value out of food, as well as recipes and food advertisements. Health weeks continue to be a way that schools deliver health content. "Issued for the 21st annual Sydney Health and Milk Week Campaign." Held by Monash University Library's Rare Books Collection. Find this item in the Library catalogue. 127 pages : illustrations ; 19 cm.